This recipe has been in our family for generations. 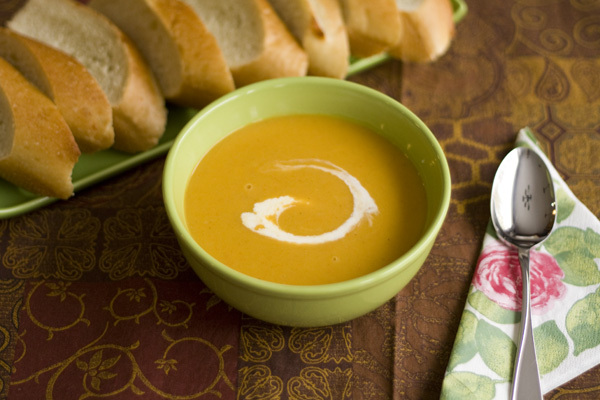 It’s delicious, creamy and so comforting on a cold day. We like to eat it with grilled cheese or French bread. First, make a roux (pronounced “roo”). Roux is a basic thickening agent used when making stews, soups and sauces. 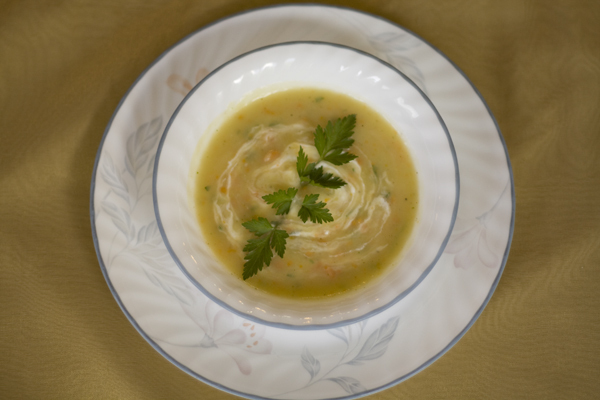 Traditional roux recipes call for equal parts of butter and flour, but in this creamy potato soup we prefer to use olive oil. 1. Heat oil in a pan. Turn the heat down to medium. Add the flour gradually and stir constantly. It should be smooth with no lumps. Keep stirring until the flour is light brown. Make sure it doesn’t burn. 2. Remove from heat and add water. Be very careful, the roux will be extremely hot, and when you add water, be careful not to splash yourself or get burned. 3. Add potatoes, carrots, Bay leaves, salt, pepper and Vegeta. 4. 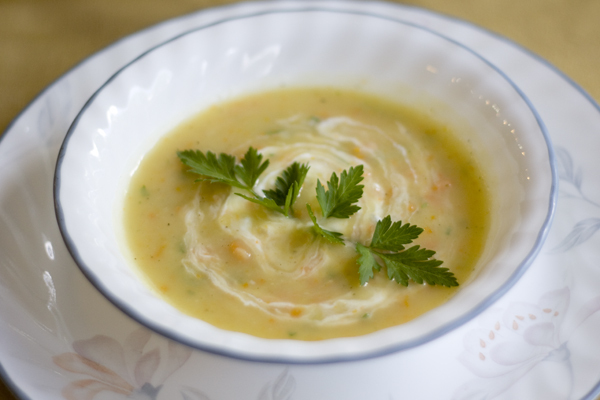 Bring to a boil and simmer for 25 to 30 minutes or until the potatoes and carrots are soft. 5. Mash with a potato masher instead of using a blender. 6. 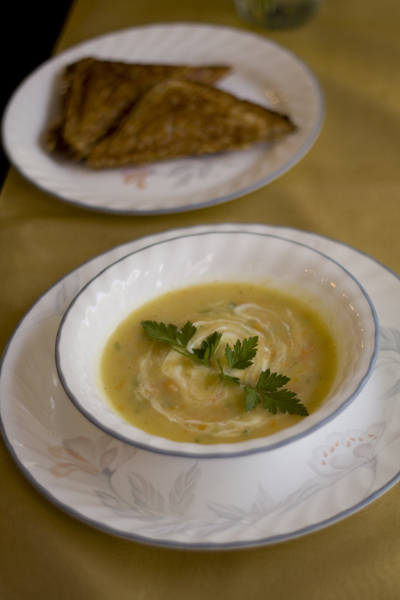 Stir in sour cream and parsley, and remove Bay leaves. 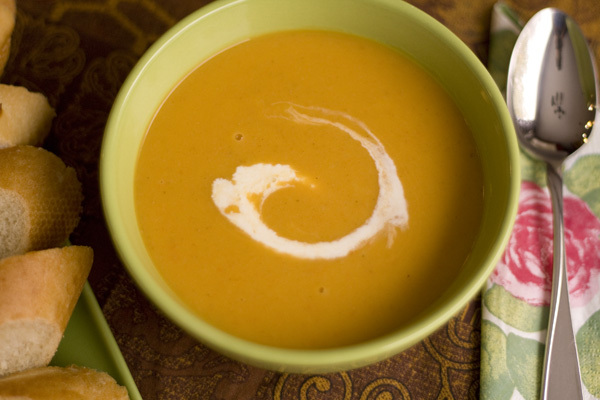 For a vegan version of this soup, omit sour cream. The soup is still very yummy. 7. 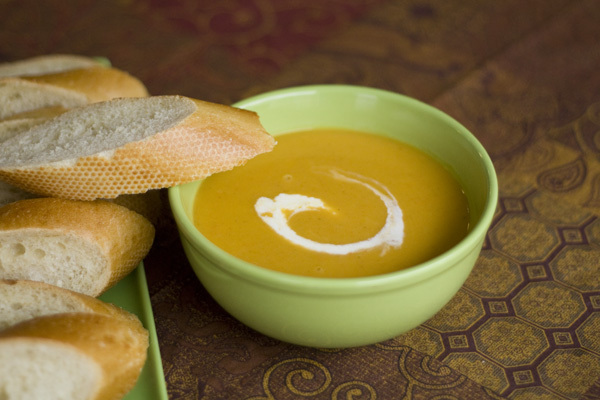 Serve hot with a slice of fresh French bread or grilled cheese.